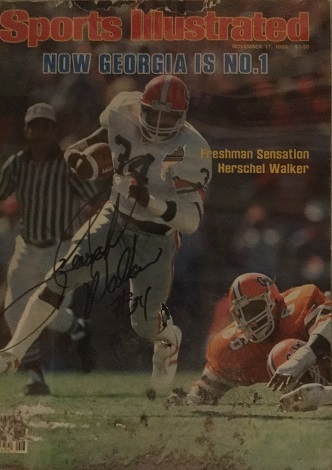 Despite having a large number of Herschel Walker autographs in the Hoard, I was able to meet him, and get an in person signature only once. That memorable day came in 1995. Herschel was playing for the New York Giants at the time, and I happened to read that he would be appearing at something called the HeathSouth, "Go For It Roadshow", in nearby Erie, Pa. I asked my wife if she would be interested in going with me, as I had hopes of maybe seeing Herschel, and snagging an autograph. She gladly obliged, and being from Erie, knew the layout, and how to get to Veterans Memorial Stadium, where Walker would appear. I took along a Sports Illustrated magazine to get signed, but realistically, had low expectations of getting it signed. I discovered after the fact, that the "Go For It Roadshow", was a traveling show sponsored by HealthSouth Corporation, in which professional athletes talked to school kids, and encouraged them to exercise, avoid drugs, and generally live healthy lives. Many famous athletes appeared at one time or another. Herschel, Bo Jackson, wrestler Lex Luger, and female bodybuilder, Cory Everson, among others. The Roadshow ran from 1995 to 2003. We arrived early, and as I was walking in, I noticed a local radio station van. The side of the van was opened at the top half, with a mesh like window screen. 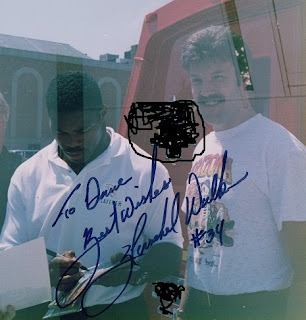 Inside, the radio guy was conducting an interview, and the guy he was talking to was none other than Herschel Walker! I walked towards the van, and another guy near me said, "That's Herschel". The radio guy put his finger to his lips to say "Shussh". We just stood their and waited, and I told the other guy I hoped Herschel would sign my SI. He had some original artwork that he hoped Walker would autograph. When the interview ended, Herschel stood up and exited the van. As he did, I said, "Mr. Walker, would you please sign my Sports Illustrated magazine?" He reached out and took my magazine, and sharpie, and signed it with a nice, bold signature. I thanked him again. He said, "You're welcome", then signed the other guys artwork, and moved away with a local police officer escorting him. Standing there looking at Herschel, I was amazed at the size of his arms, and took particular note of the many scars and scabs he had on them, doubtless from a lifetime of football hits. Unknown to me at the time, my wife had a camera, and was snapping pictures at the time. Now for the bad news. This was before we had digital cameras, so unfortunately, the film was old and the resulting pictures were double exposed. I took the best available to show here. To avoid any issues, I cropped the other people out, and also blurred out the logo and license plate of the radio station van. 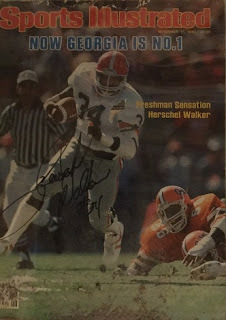 Later on, I had the photo enlarged and sent it to Herschel at a private signing, where he autographed it for me. You can see the guy holding his artwork waiting to get it signed, and you can just make out the police officer, behind Herschel's right shoulder. The issue itself has damage. There is chipping along the top, and a rip in Walker's jersey, but the signature is intact, and the day remains a great memory for me.